Read the best practices below that Jill shared. This two-part Fine Tuning highlights how Zendesk uses Zendesk to manage customer interactions across multiple departments. Click here to see part 2 . In part one of this series, Jillana focused on how hundreds of Zendesk agents in our Support, Marketing, and Finance groups coexist in one Zendesk account. She discussed the workflows, tools, and features these internal groups utilize to provide great support. You can still join the conversation by leaving a comment to ask questions and share your own pro tips! Jillana was a Customer Advocate at Zendesk before joining the Customer Success Team, and has over six years experience as a help desk agent. See all the Fine Tuning discussions. As a Customer Success Manager, I am often asked about our own Support instance and how we operate internally. I thought a Fine Tuning feature would be the perfect opportunity to highlight our interdepartmental workflows and pro tips! Our support.zendesk.com account is constantly evolving as it approaches its seventh anniversary. Agents are continually added, and groups, workflows, and processes are built, changed, and rebuilt. We’ve grown to support over 40,000 accounts across 140 countries, and have over 70,000 unique Organizations in our account. There are a lot of moving parts, and the exponential growth of our customers has meant scaling internally to keep up and provide the best possible support. The Zendesk experience starts with a trial. When you create a trial account with Zendesk, a record linked to your subdomain is automatically created in Salesforce, which in turn creates an Organization in Zendesk. The information you provided in the trial setup process, and any changes to plan type or agent count, map to custom Organization fields that are visible to agents along with ticket history in the User Data App . Our Sales team, comprised of Account Managers, Executives, Outbound and Inside Sales, tracks leads and opportunities in Salesforce and are copied on or assigned to their customers' tickets in Zendesk. They handle requests from customers or prospective accounts to add agents, become a Zendesk partner, arrange a discount, or upgrade to a new plan. Sales must also work closely with Support to communicate via tickets as Sales requests and questions come to our Customer Advocates. We strive to provide the best experience for our customers as they reach out to with requests that may require both groups’ expertise. New Enterprise customers have an additional step to the Sales and Support workflow. A Customer Success Manager will be assigned to the account for an initial consultation and up to 60 days of Launch Guidance after a ticket is sent from Sales to Success outlining the engagement. The custom fields on the Organization in Zendesk will route any tickets submitted by its users to Success during Launch Guidance. The account's Success Manager can then respond or route the ticket to the appropriate group, copying themselves, to ensure the ticket is handled in a timely manner. When the Launch Guidance engagement has wrapped up, the Organization's custom fields are updated which then change the tags on incoming tickets so they are now automatically routed to Support. The Launch Guidance ticket initiated by Sales acts as a record of the engagement with notes detailing the discussions and progress made during Launch Guidance. This ticket is referenced on the Organization record as well, providing background on the account to Customer Advocates and Account Managers. Launch Guidance is only one piece of Success at Zendesk. Existing accounts may be included in our Mentor Program, where accounts consult a Customer Success Manager to identify and focus on accomplishing a set of goals to improve their Zendesk experience. Our Strategic accounts are assigned a permanent Customer Success Executive who is dedicated to working through any unique use cases and serve as a constant source of best practices and guidance. Success works closely with Sales, Support, Product, and Training to provide a well-rounded experience for customers old and new. Next, we'll take a closer look at Zendesk Support's workflows- join us at 11 AM PDT! Customer Advocates are vital to the operations of support.zendesk.com. Routing tickets to Finance, Marketing, Product, Professional Services, Customer Account Managers, Solution Consultants, etc. our Support team ensures our support instance runs smoothly. Tier 1 takes incoming phone calls and resolves email requests about our product and its features; these are typically questions that can be resolved in less than 15 minutes. Tier 2 spends more time digging into issues and the related logs and handles requests that typically can be resolved in less than an hour. Tier 3 addresses the most complex or time-consuming tickets before sending qualified issues on to our Development team. All Support Group Views are arranged by Priority, with the tickets listed in reverse chronological order by age, so agents can hit the “ Play ” button and take the oldest, highest priority ticket first. All requests sent to support@zendesk.com or submitted from the web form go through an initial triage process. Based on the difficulty of the inquiry, some tickets are immediately sent to Tier 2 support, but the majority of tickets are sent to Tier 1 with varying priorities and ticket properties set by the Triage Agent. Each action taken by the Triage Agent has an associated macro with a tag so we can track a ticket every step of the way- from where it goes initially to where it ends up. This brings accountability and metrics to the process, and it also makes the process faster. 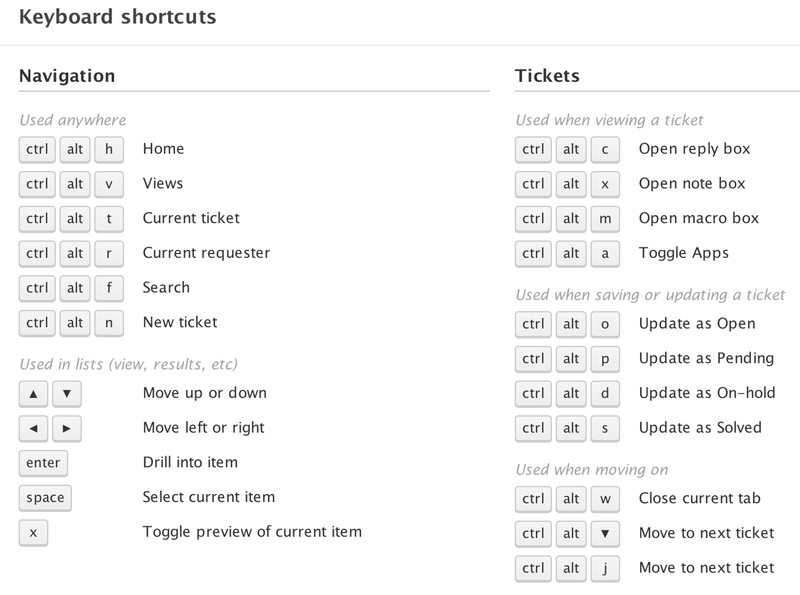 Our Triage Agents highly recommend becoming familiar with the Keyboard Shortcuts to save a surprising amount of time when handling tickets. Specifically, they use Ctrl + Alt + M to search for the appropriate macro that quickly sets the ticket fields, tags, and status so it can be assigned to the correct group or solved immediately. Having an actual agent look at every new ticket is a great way to identify issues before they become widespread, gather common product feedback requests, and get a pulse on why customers are reaching out for support. Escalation macros standardize the detailed handling information your agents need to collect before passing a ticket on to the next agent. This prevents duplicating efforts and ensures that Tier 1 Support is providing adequate information to Tier 2 support or that the Development team has the replication steps necessary to reproduce an identified issue. All Customer Advocates have a personal escalation macro that applies a tag so the amount of escalations from each individual agent is tracked and the agents can make a view to track and learn from their escalated tickets. As Zendesk is its own customer, we rely on the tools and features encourage our customer to use. We have found great value in Custom User and Organization Fields for storing customer data in Zendesk and compile Customer Lists for targeted mailing campaigns. We use the Events Log regularly to troubleshoot our own workflows as we strive to fine-tune our triggers and automations to ensure we handle our tickets as efficiently as possible. The Reporting Dashboard is also a useful tool, providing agents a snapshot of our account metrics for a given time period. The Built by Zendesk Apps in the Marketplace are popular among our agents, and the User Data App , Answer Suggestion App , and Bookmark App are used every day at Zendesk. The Sidebar Icon App is installed in support.zendesk.com to embed our Internal Knowledge Base within the account so agents can quickly look at the KB without leaving the agent user interface. We relish creating our own unique solutions to problems we face, and the Apps Framework has been used by many internal agents to create the apps you see in Zenlabs , including favorites like the Time Tracking App and Redaction App . We also promote the use of external tools that aid with global communication, such as Yammer and Flowdock . You can select what events you want pushed to the Yammer activity steam when you Notify your Yammer Feed to provide visibility to the entire company. We post customer satisfaction ratings from solved tickets, internal announcements, alerts to new features or content, and plenty of pet and baby photos! Flowdock is priceless for allowing our global teams to communicate in real time -- chatting to get a fresh perspective, collaborating to answer customer questions, or discussing product functionality. Our global Finance Operations team consists of only six people, but everyone pitches in to share the responsibilities and ticket load. Over the last year, they have collaborated with other teams to develop a more effective and efficient workflow. To begin, they discussed common questions or confusions customers called Support about concerning the Subscription or Billing pages. They reviewed the request types listed in our nested custom drop-down About field, and drilled down to specify tickets regarding cancellations, change of ownership, coupon or credit card issues, agent count increase or decrease, manual invoicing requests, reactivations, vendor, tax requests, etc. They collected data on which request types appeared most frequently, and looked at how internal process could be improved to better suit customers’ needs. Last August, the Finance team opted to move away from email workflows (attaching records of an email to other systems like Salesforce and Zuora) and move toward using Zendesk to communicate internally. Our Agent Collision feature helped enormously, as Finance had formerly struggled with multiple agents responding to the same email request. They now paste a ticket URL in external systems to link back to the historical record for conversations around sales exceptions or customer issues. A few tasks were automated, and many more were fine-tuned, to create a streamlined process for each request type, with Zendesk providing visibility to all agents. With a ticket to link to an approval process, or to include reasoning behind a pricing changing several months down the line, or to manage renegotiating a contract, Zendesk has become not only our internal historical record, but also provides a necessary time-stamped paper trail for customers or auditors alike. Our world-class Marketing department consists of a crew of fewer than 50 people, broken into specialized groups. With a sole triage agent, tickets are assigned to sub-groups like Customer Marketing, Product Marketing, Creative, and the Web Team. Some tickets are created directly from the marketing@zendesk.com address, while others are sent over by Support, including the couple hundred of twickets received each week. Facebook and Twitter posts to Zendesk that are not Support requests are passed along to the Marketing team using a simple macro, with an internal note to provide some context on the issue or customer. For example, our agents are fond of the ‘Love Tweets’ macro that directly assigns a twicket to a Marketing agent with the tag ‘love_tweet,’ so it can easily be tracked (we’ve seen 250 in the last 30 days!). Whether it’s heralding new features in the product, delivering public announcements, or providing updates on service disruptions, @ZendeskOps and @Zendesk are the voice of the company! Social Media channels generate the majority of tickets, but Marketing also receives requests regarding mailing lists, suggested content for our site, concerns about our brand, or simple requests for stickers. Lots of stickers. Our Marketing team is constantly planning fun and interactive events around the globe for our customers. They manage Eventbrite pages for RSVPs and the logistics of these events, and handle any questions or concerns that come in through Support. There is a ton of work behind the Zen U tour and ensuring the venue, food, and the supplies and technology necessary for our presenters is all ready to go on the day of! Even our User Groups and Bootcamps hosted by our customers take some legwork to ensure the vendor provides food and beverages, and there is plenty of swag for the attendees. Hi Jill! I'll start off with a question. Are all of the departments you'll be discussing today (Sales, Customer Success, Finance, and Marketing) given full agent access to Zendesk? Are any of them light agents? Hey Chandra! Great question- we do not really use Light Agents internally, as we need to be agents to be assigned tickets and respond publicly to customers. We may have a need down the road, but for now, all Zendesk employees are full agents in support.zendesk.com. How do you work with multiple offices/timezones? Is there several people that triage or are there triggers/targets for each office? We have triage agents across our global offices so there is always someone to route new tickets, with the goal of always keeping the triage queue empty! There are regional groups, for instance, I'm in the CSM (AMER) group, while we also have EMEA and APAC CSM groups. Tickets are routed based on the end-user's location when appropriate, but we like to address issues as they come in so we don't silo the work to only agents in that region. We strive to be a truly global company and provide " follow the sun" support, and we talk to our colleagues overseas every day. Communication and up-to-date documentation is key! Thanks for the ebook! We're starting to set up multiple offices and also offer multiple languages - this is proving to be quite the challenge for us. It's definitely an evolving process rather than something you can just switch on overnight! Best of luck and know we're here to help in any way we can! It must be tricky to introduce new Triggers and Automations without stepping on the "toes" of your existing ones. Do you beta test new triggers/automations? If so, how do you copy what you are actively using into the Sandbox environment (if that's how you test it). @Justin, speaking as the person in charge of introducing new Triggers and Automations to our instance, happy to advise! The first thing I do though is know each one of our triggers as best I can, and lock down who is actually able to edit/add new triggers (we actually just did a major pruning of admins on our own instance, which has helped me considerably). The second really important tool I use is the rule analysis so I can review any tags/group/agent assignments that might interfere. The other not very useful answer here though is that as a long-time advocate now supporting our own Zendesk instance, I have a ton of experience troubleshooting and building business rules. That definitely helps a lot. As soon as I build new triggers, I immediately create test tickets to try them out. Even if they appear to work fine, I check out the ticket events to make sure that every trigger firing on a ticket is one that I'd expect. We don't use a sandbox right now, although conceivably we could use the API to 'migrate' our business rules from our main instance to our sandbox. Right now, we've decided that's not necessary though. One last thing that's important to always have is a sort of 'forgotten ticket' view. I'm constantly concerned that an errant trigger, a misconstructed macro, an off-the-mark view have resulted in tickets that might not get the attention they need. I've created personal views that keep an eye out for these tickets. I look for tickets that are unassigned and pending/on-hold and tickets unassigned in groups that don't have active agents looking through them. Obviously, I have to have a pretty good knowledge of the ticket lifecycle in our instance, and that's a tall order since almost every team at Zendesk uses our main instance. Overall, it really comes down to vigilance especially if a business rule affect our most critical ticket path (incoming tickets routing through our support teams). I hope that's a bit enlightening. Try and ensure that not many people edit your triggers, name them as clear as you can, pay attention to ticket events, and test things as soon as you put new business rules into your instance! Of course if something is broken and you're not sure why, give us a call!! Good Morning ZenDesk, With our customer service we provided customer facing assistance for a 350+ client that utilize our technology. we run into the problem of macro overload that makes it excruciating to scale and on board new clients as we have about 15 standard macro responses for each client that we utilize. With organizations can we set it up so that the macros can fill in the unique client information such as contact information. managing 15 standard macros would superior 15 per client that are essentially saying the exact same thing. Is this something that could be executed if we were smart about utilizing organizations within ZD. Is Zendesk planning on migrating to Help Center? What are the issues holding up that change? What reports are the support managers looking at on a regular basis? Great questions- I am going to pull in my colleagues to give specifics, but I will just say in regards to Zendesk's Help Center, it's going to be amazing! 11 AM Content is now posted: How Support manages tickets. Keep the questions coming and please share any relevant insights on your own operations! "We're waiting for several features we need to manage our community, which are coming soon, and we also needed the API in place so that we could build some custom tools to support our publishing process. We have a massive amount of content in 6 languages and we maintain the source files outside of Zendesk in an XML-based format so we needed an automated way to publish and update content. See this article that describes the process we're now using: https://support.zendesk.com/entries/53090153-Automating-your-first-localization-handoff-Help-Center-. We've completely switched to Help Center for every other part of our business: IT, HR, Training, etc. This site will be switched to Help Center very soon and we're very excited to make the move. " That way you could just maintain your general macros, have all the unique information stored at the Org level, and pull that in on a ticket by ticket basis. I'm a support manager within our Product Support team and would be happy to go over some of the reports and things I am looking at on a daily basis! GoodData: I have a GoodData dashboard created displaying my team's key stats by week. These stats include number of tickets solved, good and bad satisfactions, and average handle time / ticket. This gives me a good snapshot of how our advocates are doing and where we might need improvement. Views: We have a couple key Views in Product Support that I am keeping a close eye on. Specifically our Untriaged View and our Unassigned Tickets View. For more information on the Triage process that we use, check Jillana's section on Queue Management. Within our Unassigned Tickets View I am keeping a close eye on the number of tickets present as well as the High priority tickets to make sure they are addressed as quickly as possible. Finally, I have some personal Views that I use to keep a close eye on specific advocates, especially those who are new to the team. I am looking at their assigned tickets and their responses as a form of quality assurance. Dashboard: We have an internal dashboard that I almost always have up in a second monitor that gives me some key pieces of information. Most relevant to me is our phones presence. I can see how many advocates are logged in, who is available, and who is on a call. This allows me to monitor volume and make sure we have enough coverage and respond accordingly. In our dashboard I can also see all three support tier queue numbers, our Twitter feed, key calendar events, and the times in our other offices! I hope this helps! If you have any follow-up questions just let us know! Great discussion so far. I thought 266 triggers was a lot to manage but I guess you confirm my belief that sometimes you need that many. The discussion of agents vs light agents is one that could run forever but for most of us the cost of full agents is a concern. How would things change for you if you had to have a mix? Could you engineer process to accommodate? Triggers are a lot to handle, and I think Avi hit the nail on the head above in terms of his tips on clearly labeling and restricting them! As for our agents, I think we would be able to move some full agents to Light Agents today if necessary. I can only speculate, but some groups, or managers in general, are typically involved for oversight or consultation rather than being assigned a ticket to reply directly to a customer. It is nice to have the option to assign these groups or managers to a ticket so they can update ticket properties or make public comments though! Were we to change them to Light Agents, we would just have to rely on CCs and Internal notes more, but I don't think too much would change in our day-to-day operations. I have a question about tags... As we use Zendesk more and more I am/ will be required to draw from past, current and tickets of the future to analyse support eg. Support we have given to particular products. I appreciate there are a number of ways of doing this but I feel that tags could be a good method. However I have a question when there are a number of agents how do you stop each one creating a variation of a tag which means that when the time comes for the analysis there may be many tags required to get one piece of information. eg. product_fridge ; fridge_product ; fridge ; productfridge etc.. not the best example but I hope you see what I mean. I would recommend creating a custom drop-down field, nesting the options to drill down into the types of products you use as each selection will automatically apply a tag to the ticket. This way, you're standardizing your tags and not allowing for agents to come up with them on the fly, and the drop-down options can be used for reporting and business rules as well! @Ian, my preference is to use custom drop down fields in these cases. Custom drop downs are basically just a GUI for assigning a set/controlled list of tags to tickets. That way you can make sure that your agents are applying tags consistently. Thanks Avi. That is a good idea. I'll do that. @Colin YES! That too. EVERY macro I build for our team has associated tags so I can track their use. 2 PM Content is now posted: How Finance and Marketing handle customer requests. Keep the questions coming and please share any relevant insights on your own operations! @Avi - regarding your role as Automation Man, how do you keep all those pieces straight - is that only using rules analysis or do you keep some type of document/flow chart that references what each trigger/macro/automation does? My director is also concerned that if I fall off the turnip truck, we have no documentation. I waffle on that because it's meant to be dynamic - if i have to document it with every tweak we make, that's prohibiting, but she does have a point. @Diane, sorry I didn't see this earlier! Of course, that's a huge project and you're right, this is meant to be dynamic and documenting every trigger tweak is not ideal. We also can't avoid turnip trucks though, which leaves us between a rock and a hard place. At least cleaning up the naming conventions has been really helpful for us. Just having a discussion with our community about this has brought up a lot of good ideas. Things like folders for triggers/automations, a notes field for business rules, quick links from trigger/automation editing to the business rule analysis for added/removed tags. Things like that. brb gonna go bug our product team! So! Number 1 suggestion right now would be to work on a standard naming convention including, as best you can, the purpose and owner of each business rule. where or when is part 2? Part 2 will be posted throughout the day on June 26th, focusing on our internal groups that use separate instances rather than support.zendesk.com so stay tuned! Thanks for your interest! We just moved Part 2 to June 26th. I'll edit Jill's comment so there's no confusion. And we'll post a link to Part 2 here when it starts so you'll all know! Great article. I've been bugging your support to share Zendesk's workflows as we were struggling a bit with our escalations. Happy to see this is now available for all! We also struggle with our Sales/Finance/Managment Team who cannot be assigned tickets or have their own My a Ticket view. We also have Sales still using old fashioned e-mail, as a full agent account for exarch would be too costly (as we also have SalesForce and other sales tools for them). For Zendesk, it's easy to have all their employees on full agent account, as they are their own customer. It would be great if light agents would have all rights that regular agents have, with a limitation of **hours** they can use Zendesk, instead of limiting **functionality**. (this is what Zendesk's competitors do). We aim to make working with external parties easy with Light Agents, CCs, and Email Targets, but a full agent license would be needed to be assigned to and solve tickets. From a Light Agent's user profile, they can see the tickets they are copied on or set as the requester on so that may help when you need assistance from Sales / Finance / Management through internal comments. Give us a call or email if you're having trouble figuring out the best way to work with your entire team, and of course, thank you for the feedback! How would you best recommend to roll out a tiering support method? So, if I had a list of 40 customers that I wanted to be assigned to a specific tier and group of agents, what tools should I utilize? I definitely recommend planning out your new structure beforehand by whiteboarding or creating flowcharts for your re-imagined groups and workflows. Once you have a concrete idea of what agents belong to which groups, you can edit or add your new groups in Zendesk. Now on your Organization profile, you can set a group that will automatically receive an Org's tickets. Personalized routing in two *potentially* quick steps! Alternately, you can use the Org or a tag in your business rules to create a specific view or routing rules for certain customers. Check out this article to get the ideas flowing and share the results here!